Discover Jesus Throughout the Old Testament! The son trudgesuphill, bearing wood for his own sacrifice; his father has decided to give himup to death. What biblical event does this bring to mind? Is it Abraham andIsaac in Genesis 22, or Christ's passion in the Gospels of Matthew, Mark, Luke,and John? The kinship between these two stories is deeper than merecoincidence. Christ is present in thestory of Abraham and Isaac. In fact, he is present on every page of the OldTestament. Christians seem to have forgotten that theOld Testament has everything to do with Jesus Christ. In Jesus on Every Page, David Murray guides the reader down his ownRoad to Emmaus, describing how the Scriptures were opened to him, revealingJesus from Genesis 1 to Revelation 22. Dr. Murray's ten simple ways to seek andfind Christ in the Old Testament unveil the face of Christ in the creation, thelaw, the psalms, the prophets, and the proverbs. Recognizing Jesus in the full breadth of Scripture is importantfor every Christian. Whether you arepreaching Jesus through Old Testament readings or just beginning todiscover the reality of Christ in the Old Testament, Jesus on Every Page provides an accessible guide tothe increasingly popular subject of Jesus in the Old Testament books. Have yourown Road to Emmaus experience and know the Old Testament for what it truly is: fullof Jesus. About "Jesus on Every Page"
Dr. David Murray is Professor of Old Testament and Practical Theology at Puritan Reformed Theological Seminary, and Pastor of the Free Reformed Church in Grand Rapids. He was ordained to the ministry in 1995 and pastored two churches in Scotland for 12 years. He is the author of Christians Get Depressed Too, How Sermons Work, and Jesus on Every Page, and regularly speaks at conferences in North America and beyond. David and his wife Shona have five children and they love camping, fishing, boating, and skiing in the Lake Michigan area. 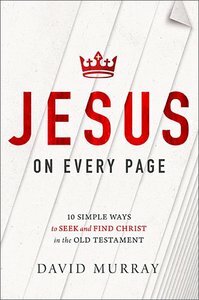 Customer Reviews For "Jesus on Every Page"
What does Jesus On Every Page promise? David Murray moves crisply and confidently through his material. He covers a lot of ground, but does so clearly and inductively. Illustrations are relevant and the tone is warm. The first of the two parts is a consideration of the New Testament witness of Jesus, Peter, Paul and John to the question What's The Old Testament About? Starting with Jesus' assertion that the Scriptures of the Old Testament are primarily about himself, Murray they unfolds how the Apostles understood that position and how they applied it to their own teaching of the Old Testament. The secondly part of the book applies that apostolic reading to the various genres of the Old Testament, identifying the presence, work, and promised redemption of the second person of the Trinity as it is revealed. Murray provides ten alliteratively titled chapters: Christ's Planet: Discovering Jesus in the Creation; Christ's People: Discovering Jesus in the Old Testament Characters; Christ's Presence: Discovering Jesus in His Old Testament Appearances; Christ's Precepts: Discovering Jesus in the Old Testament Law; Christ's Past: Discovering Jesus in Old Testament History; Christ's Prophets: Discovering Jesus in the Old Testament Prophets; Christ's Pictures: Discovering Jesus in the Old Testament Types; Christ's Promises: Discovering Jesus in the Old Testament Covenants; Christ's Proverbs: Discovering Christ in the Old Testament Proverbs; Christ's Poets: Discovering Christ in the Old Testament Proverbs. Each of these provides numerous examples and demonstrates great nuance whether pointing out the preincarnate appearances of Jesus, the fulfilment of the covenant promises, the ultimate expression of types and a wonderful chapter on the poets with a detailed examination of the Song of Songs. What I'm not sure about? Nothing. As an introduction anything that I could observe is really beyond the scope of this book's brief. Perhaps some sort of bibliography to point readers to different works that would help them further their application of these studies to preaching, Bible study or discipleship would be helpful. I was familiar with a lot of this content, but David has synthesised it wonderfully and presented it in a format that every reader of the Bible should be able to apply its precepts and understand how the person of Jesus is central to understanding all these texts. Jesus On Every Page is a very useful guide in understanding the consistent testimony of the Scriptures about God's redemptive purpose in Jesus. In doing this it helps the reader to have confidence that God's people in every age have been saved by grace through faith in that redemptive purpose, such as it was revealed in various means throughout biblical history. This enables the reader to have confidence that each page of the Scriptures can encourage our faithful response to the saving work of Jesus. Highly recommended for individual study or group reading. The pdf copy of Jesus On Every Page upon which this review is based was provided by Nelson Publishers as part of a blog review program for the book. A positive review was not a requirement.